I’ve been making a grain free banana cake for years. 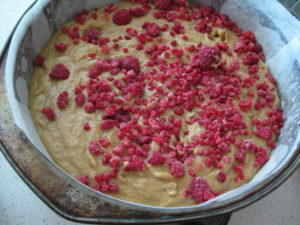 This version is the “new and improved” version and the added raspberries make it something special, but it is still relatively inexpensive to make as it only uses two eggs. The original recipe this one is based on is here. This version I think is “healthier” as it uses coconut sugar and coconut oil. 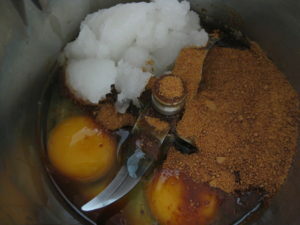 1/2 cup / 85g / 3 oz of coconut sugar or rapadura sugar. 2 mashed very ripe bananas (or 3 if they are small). You can mix all ingredients together by hand in a bowl, or throw in a food processor or thermomix and blend until smooth. Coconut oil can be solid or liquid depending on the room temperature. 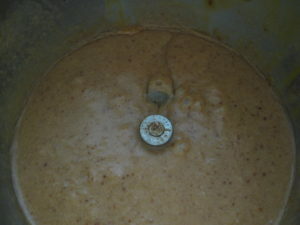 If its solid, use a blender or melt it before adding to the other wet ingredients. My blended eggs, coconut oil, coconut sugar and bananas. The mix should be well blended and smooth. ½ cup / 70 g / 2.5 oz potato or tapioca flour. If you don’t want to use any starch, just use another 1/2 cup of almond meal instead. Your cake will have a heavier/denser texture. Roughly 1/2 tsp cream of tarter and 1/4 rounded tsp of bicarb (also called sodium bicarbonate or baking soda). I am never super exact when I am measuring this, it always seems to turn out regardless. and a good pinch of sea salt. Fold into dry ingredients, until well mixed. If I am mixing this by hand I sift the cream of tarter and bicarb through the flour before adding to the wet ingredients. If I am making it in a food processor/blender/thermomix I just throw it all in and let the blender do the mixing. Mix until well mixed and smooth. My grain free banana cake about to be put in the oven. Pour into a medium cake pan – round, square it doesn’t matter. Make sure you grease and line with baking paper. At this point I crumble a few handfuls of frozen raspberries (about half to one cup) over the top just prior to putting it in the oven. The raspberry crumbs melt and caramelize into the top of the cake while cooking. Mmmmmmm. Bake in a moderate oven at 180 degrees Celsius / 350 degrees fahrenheit for 30 mins or until a skewer inserted into middle comes out clean. This cake does not need icing/frosting as the raspberry crumble makes for an amazing toping. The coconut oil and coconut sugar give it a lovely caramel texture. I don’t have a picture of the finished cake – it was eaten very quickly.